Orli Shaham has performed with the Los Angeles Philharmonic and the Atlanta, Baltimore, Boston, Chicago, Cleveland, Dallas, Detroit, Houston, Philadelphia, St. Louis, San Francisco, Seattle, San Diego and Utah symphony orchestras; and internationally with the BBC Symphony Orchestra, Bilbao Symphony, Filarmonica della Scala, Israel Philharmonic Orchestra, Malaysian Philharmonic, Orchestra della Toscana, Orchestre National de France, Orchestre National de Lyon, Stockholm Philharmonic, Sydney Symphony Orchestra, and the Taiwan Philharmonic. A frequent guest at summer festivals, she has performed at Amelia Island, Aspen, Australian Festival of Chamber Music, Bravo Vail, Caramoor, La Jolla, Mostly Mozart, Music Academy of the West, Orcas Island, Peninsula, Ravinia, Spoleto, Sun Valley, Tanglewood, and Verbier music festivals. Ms. Shaham has given recitals in North America, Europe, Asia and Australia at such renowned concert halls as Carnegie Hall, The Kennedy Center, Chicago's Symphony Hall, Amsterdam's Concertgebouw, Frankfurt's Alte Oper, the Herkulessaal in Munich and City Recital Hall in Sydney, and has worked with many eminent conductors including Sir Neville Marriner, Sir Roger Norrington, Christopher Hogwood, David Robertson, Wolfgang Sawallisch, Leonard Slatkin, Robert Spano, Jaap Van Zweden, Gerard Schwarz, Nicholas McGegan, Hans Graf and Jacques Lacombe among others. In performance she has collaborated with the pianists Emanuel Ax, Joseph Kalichstein, Jon Kimura Parker and Marc-Andre Hamelin, the cellist Lynn Harrell, the violinists Gil Shaham (her brother) and Phillip Setzer, and the sopranos Christine Brewer and Michelle DeYoung, among many others. Celebrating the 100th anniversary of Leonard Bernstein’s birth over the 2017/18 and 2018/19 seasons, Ms. Shaham joins the Indianapolis Symphony Orchestra (Michael Francis conducting), Orlando Philharmonic (Eric Jacobsen conducting), China NCPA Orchestra (David Robertson conducting), Bochumer Symphoniker (Steven Sloane conducting), Dallas Symphony Orchestra (David Robertson conducting), and San Diego Symphony (Steven Sloane conducting) for performances of Bernstein’s Symphony No. 2 Age of Anxiety. In addition to performances of Bernstein’s Age of Anxiety, highlights of the 2018/19 season include performances with the Austin Symphony Orchestra (Peter Bay conducting), Milwaukee Symphony Orchestra (Joshua Weilerstein conducting), and Hawaii Symphony Orchestra, and John Adams’ Grand Pianola Music with the Los Angeles Philharmonic (conducted by the composer). In addition to Ms. Shaham’s chamber music recital at the 2018 Aspen Music Festival, she continues to serve as the Artistic Director for Pacific Symphony’s chamber music series in Costa Mesa, California, a position she has held since 2007. She is a featured performer on each of the chamber recitals throughout the series. Other chamber music highlights include the world premiere and subsequent performances of the complete John's Book of Alleged Dances by John Adams in a transcription for prepared piano and string quartet by Simon Frisch commissioned by Ms. Shaham. Highlights from the 2017/18 season include performances with the Indianapolis Symphony (Michael Francis conducting), St. Louis Symphony (David Robertson conducting), Nashville Symphony (Giancarlo Guerrero conducting), Santa Rosa Symphony (Graeme Jenkins conducting), Bangor Symphony Orchestra (Lucas Richman conducting), and Orlando Philharmonic among others. In the fall of 2018, Orli Shaham releases a recording on the Canary Classics label of Mozart’s piano concertos K.453 and K.491 with the St. Louis Symphony Orchestra, David Robertson conducting. Ms. Shaham’s acclaimed recording, "Brahms Inspired", is a 2-CD set released in 2015 of new works by Brett Dean, Avner Dorman, and Bruce Adolphe alongside works of Brahms and his compositional forefathers. The New York Times praised Ms. Shaham's "beautiful performances" on the recording, calling it "a treasurable album." The St. Louis Post-Dispatch stated that the album "takes the listener on an intellectual as well as a musical journey" and cited Ms. Shaham's "musical intelligence and integrity." In addition to "Brahms Inspired", Ms. Shaham's 2015 recordings also include her performance of John Adams' Grand Pianola Music with the pianist Marc-André Hamelin and the San Francisco Symphony, with the composer conducting, featured on the SFSO album "Absolute Jest". Arts Desk’s Graham Rickson raves, “Pianists Orli Shaham and Marc-André Hamelin dazzle…” In 2014, Orli Shaham released "American Grace", a CD of piano music by John Adams and Steven Mackey featuring the recorded premiere of Mackey’s Stumble to Grace (written especially for Ms. Shaham) with the Los Angeles Philharmonic, David Robertson conducting. Brian Wigman of Classical.net praised the album as having “nuance to the playing, and a sense of grace and poetry.” Composer John Adams himself wrote of Ms. Shaham’s collaboration with Jon Kimura (Jackie) Parker on his two-piano work Hallelujah Junction, “any composer should be so lucky to receive such a reading as Orli and Jackie have done,” and the French magazine Pianiste praised the CD, saying "this album could well propel [Shaham] to the forefront of the world stage." The previous year, Ms. Shaham released the CD "Nigunim - Hebrew Melodies", recorded with her brother, the violinist Gil Shaham. The album features showpieces by Ernest Bloch, Joseph Achron, and Leo Zeitlin as well as a newly commissioned work by Avner Dorman. She and Gil Shaham have collaborated on several additional recordings including "Dvorák for Two" on Deutsche Gramophone, an all-Prokofiev disc ("As fine a recording of the violin and piano music of Prokofiev as has ever been made by one of the finest violinist and pianist teams of the last ten years." Barnes&Noble.com), and "Mozart in Paris" featuring Mozart’s Six Sonatas, Op. 1. Orli Shaham’s interactive concert series for young children, Baby Got Bach, founded by her in 2010, is recognized by parents, media and the music community as a significant force in music education and entertainment for pre-schoolers. The wildly popular series is included in New York Magazine's "Best of New York" list, and has been cited as "magical" and "a terrific family event" in the press. The concert programs provide hands-on activities with musical instruments, concepts and concert performances that promote good listening skills, and feature chamber music performances by professional musicians with Ms. Shaham as host and pianist. Baby Got Bach has been presented by the 92nd Street Y in New York, the Aspen Music Festival, and in St. Louis. Following the collaborations with Sō Percussion in 2016, WindSync in 2017, and the Rolston String Quartet in 2018, Baby Got Bach returns to Richardson Auditorium at Princeton University in the 2018/19 season with special guest performers the Westerlies. In addition to her activities on stage, Ms. Shaham frequently gives master classes and has served on the jury of numerous piano competitions, including the Cliburn International Junior, New York International, Sydney International, and Virginia Waring International piano competitions. Committed to music education, Orli Shaham serves as a member of the Board of Trustees of Kaufman Music Center and as the Chair of The Advisory Board to the Lucy Moses School, New York's largest Community Music School. Driven by a passion to bring classical music to new audiences, Ms. Shaham has maintained an active parallel career as a respected broadcaster, music writer and lecturer. In 2012 and 2013 she served as the host of "America’s Music Festivals", a radio program nationally broadcast to over 100 stations. From 2005-2008 she was host of "Dial-a-Musician," a feature she created especially for The Classical Public Radio Network. The concept of the program was to enhance listeners' experiences of music and musicians by directing listeners' questions about classical music to internationally renowned musicians, calling them on the phone to discuss the topic. Ms. Shaham has taught music literature at Columbia University, and contributed articles to Piano Today, Symphony and Playbill magazines and NPR’s "Deceptive Cadence" blog, and was artist in residence on National Public Radio’s "Performance Today". Orli Shaham was recognized early for her exceptional talents. She received her first scholarship for musical study from the America-Israel Cultural Foundation at age five to study with Luisa Yoffe at the Rubin Academy of Music in Jerusalem. By age seven, she traveled to New York with her family to begin study with Nancy Stessin, and became a scholarship student of Herbert Stessin at The Juilliard School a year later. She won the Gilmore Young Artist Award and the Avery Fisher Career Grant, two prestigious prizes given to further the development of outstanding talent. In addition to her musical education at the Juilliard School, Orli Shaham holds a bachelor's degree in history from Columbia University and pursued a master's degree in musicology from Columbia. Orli Shaham is married to conductor David Robertson, and has two stepsons Peter and Jonathan, and twin sons Nathan and Alex. 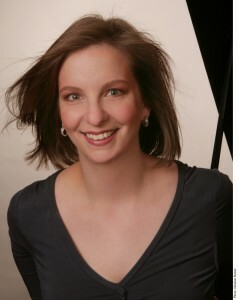 Orli Shaham has been a Steinway Artist since 2003.